3D printing and other additive production techniques make it possible to manufacture materials with internal structures of previously unimaginable complexity. This is interesting for lightweight construction, too, as it enables the development of materials that have the highest possible share of interior voids (to make the materials as light as possible) but are simultaneously as robust as possible. Achieving this requires that the internal structures be intelligently organised for maximum efficiency. 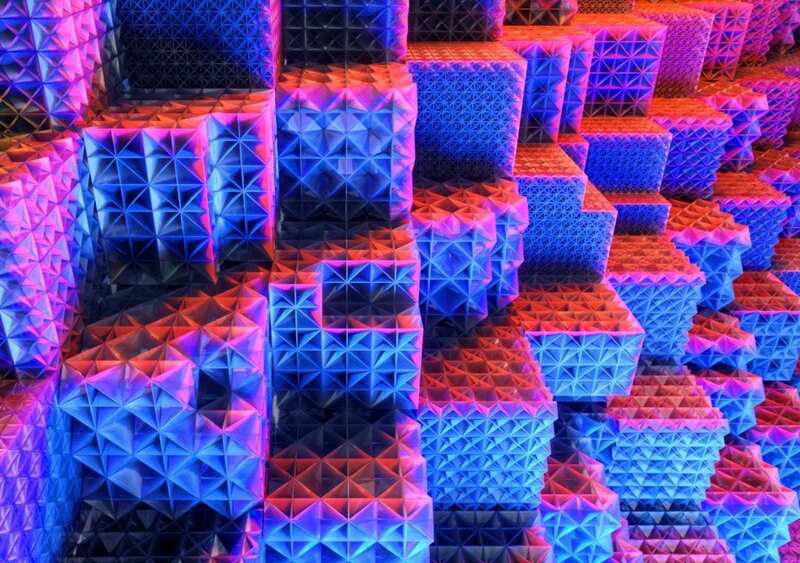 A research team from ETH Zurich and MIT led by Dirk Mohr, Professor of Computational Modeling of Materials in Manufacturing, has developed and fabricated material architectures that are equally strong in all three dimensions, and that are simultaneously extremely stiff. It is possible to determine mathematically just how stiff materials with internal voids can theoretically become; Mohr’s structures have been shown to come extremely close to this theoretical maximum stiffness. Put another way, it’s practically impossible to develop other material structures that are stiffer for the given weight. A characteristic feature of the design is that the stiffness in the material’s interior is achieved through plate-lattices rather than trusses. “The truss principle is very old; it has long been used for half-timbered houses, steel bridges and steel towers, such as the Eiffel Tower. We can see through truss lattices, so they are often perceived as ideal lightweight structures,” says Professor Mohr. “However, using computer calculations, theory and experimental measurements, we have now established a new family of plate-lattice structures that are up to three times stiffer than truss-lattices of the same weight and volume.” And it is not just the stiffness (resistance to elastic deformation) of these structures that approaches theoretical maximum values: their strength (resistance to irreversible deformation) does, too. The ETH researchers initially developed these lattices on the computer, calculating their properties in the process. Then they produced them at the micrometre scale from plastic through 3D printing. Mohr emphasises, however, that the advantages of this design are universally applicable – for all constituent materials and also on all length scales, from the very small (nanometre-sized) to the very large. Mohr and his research team are ahead of their time with these new lattices: at present, manufacturing with 3D printing is still relatively expensive. “If these kinds of lattices were to be additively manufactured from stainless steel today, they would cost as much per gram as silver,” says Mohr. “But the breakthrough will come when additive manufacturing technologies are ready for mass production. Lightweight construction, the current cost of which limits its practical use to aircraft manufacturing and space applications, could then also be used for a wide array of applications in which weight plays a role.” In addition to making structures lighter, the numerous voids also reduce the amount of raw materials needed, and thus also the material costs.